You'll get the best value around when you stay with us thanks to our affordable RV camping rates with full hook-ups at every site and modern amenities. From free Wi-Fi™ to heated showers, find out why we are the vacation destination for families from around the world. Once you visit us, you'll want to keep coming back again and again. 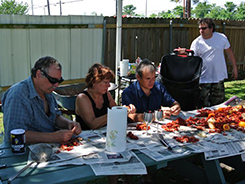 Jude Travel Park is a full-service RV park and campground with full hook-ups, located just five miles from the French Quarter in downtown New Orleans, Louisiana. Our park is locally owned and operated, and has been providing families with a clean and comfortable place to stay for more than 30 years. We are pet-friendly, and our shuttle service and location on the city bus line makes staying with us incredibly convenient, especially for visitors to the French Quarter, Superdome, Convention Center, or Audubon Aquarium of the Americas. Rental cars and taxis are also available. In addition to providing all the amenities your family will need to enjoy their stay, we sell tickets for city tours, swamp tours, boat cruises, and other popular attractions. Let us be your full-service concierge, and leave the planning to us so you can just relax and enjoy your vacation. After Hour Calls Until 9:30 p.m.